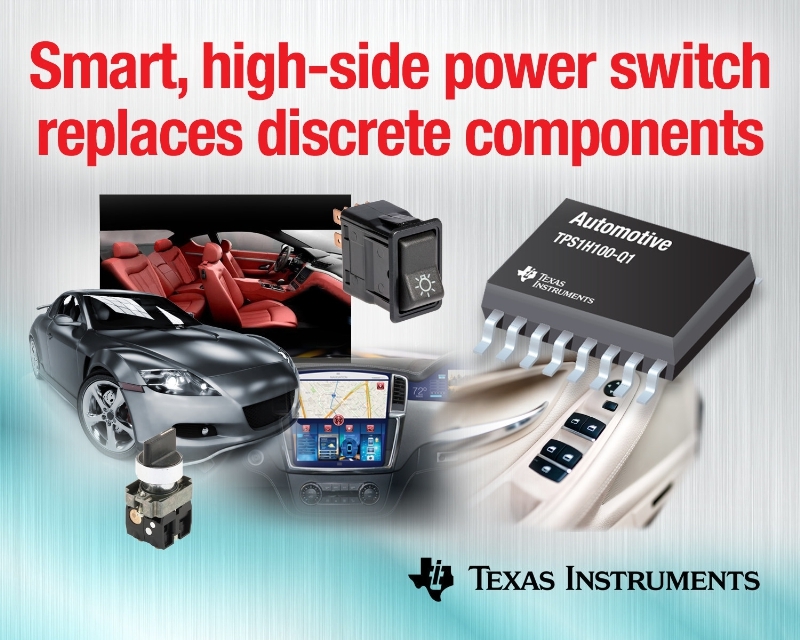 Bangalore — Texas Instruments (TI) (NASDAQ: TXN) today introduced the industry’s first smart, high-side power switch with programmable current limit. As automotive systems become more complex, the various loads within the system can each require different profiles during operation. Using the TPS1H100-Q1, designers can drive various loads with advanced flexibility in powertrain, body-electronics safety and driver-information systems where reliability is paramount. For more information and to order samples, see www.ti.com/tps1h100-q1-pr. The TPS1H100-Q1 also offers 20 percent higher current-sense accuracy versus the competition to enable intelligent, real-time diagnosis of its loading conditions. System designers can benefit from the device’s simplicity and flexibility to reduce circuit complexity while advancing their systems. Highest-accuracy current sense:5-mA current-sense accuracy gives designers the ability to leverage sophisticated load-checking to adjust the driving profile, detect system deterioration, locate problem areas, or judge circuit conditions. Programmable current limit:The TPS1H100-Q1 is the first to provide adjustable current-limit capability to allow flexible control. High-avalanche energy-dissipation capability:A high-voltage avalanche structure eliminates Zener transient voltage suppressors and free-wheel diodes to address voltage surging for inductive load recirculation. Automotive Electronics Council (AEC) Q100-012 Grade A compliance: Guarantees zero failure for lifetime reliability in automotive and industrial environments. TI’s portfolio of load switches can be used for a variety of applications from power savings to power distribution and power sequencing. These highly-integrated devices reduce overall BOM count and solution size, as well as add additional protection features. The automotive BCM reference design addresses common design challenges such as load driving, condition diagnostics and fault detection. Designers can use this TI Designs reference design to quickly design door locks; window lifts; seat heaters; heating, ventilation and air conditioning (HVAC); lamps; and light-emitting diodes (LEDs). The TPS1H100EVM evaluation module (EVM) allows customers to evaluate the TPS1H100-Q1 for resistive, capacitive and inductive load layout. The EVM is available for US$29. The TPS1H100-Q1 is available in a 14-pin, 5.0-mm by 6.4-mm thermally enhanced thin shrink small-outline package (HTSSOP). Suggested retail pricing in 1,000-unit quantities starts at US$0.80. Read more about a new approach for inrush current clamping with smart, high-side switches. Get support in the TI E2E™ Community Automotive Forum, where engineers can search for solutions, get help, share knowledge and solve problems with fellow engineers and TI experts. Follow what TI motor drive and control experts have to say on our blog:Behind the Wheel. TI’s state-of-the-art semiconductor products allow manufacturers and system suppliers to deliver world-class features to the automotive market. Our extensive automotive portfolio includes analog power management, interface and signal chain solutions, along with DLP® displays, ADAS and infotainment processors, Hercules™ TMS570 safety microcontrollers and wireless connectivity solutions. TI offers SafeTI™ parts designed to facilitate OEMs’ compliance with the requirements of ISO 26262, as well as parts specifically designated as compliant with the AEC-Q100 and TS16949 standards, all with excellent product documentation. Visit TI’s Automotive page or TI’s E2E™ Behind the Wheel Blog to learn more about our commitment to automotive innovation. Trademarks – TI E2E, Hercules, SafeTI and DLP are trademarks of Texas Instruments. All other trademarks and registered trademarks belong to their respective owners. Asus Zenfone 6 A600CG Hands-on Review: Still The Best Phablet in 2015?